OFFER GOOD FOR DELIVERIES FROM MARCH 26TH TO APRIL 30TH. Order within 1 hour 12 minutes for Same Day Delivery! Mom and Pop Flower Shop! 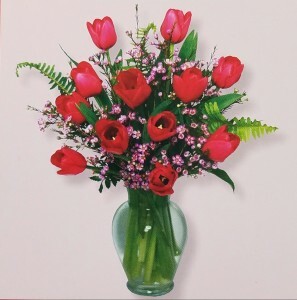 Tiptoe through the window By the window, that is where I'll be Come tiptoe through the tulips with me Design contains a dozen red tulips, pink waxflowers, salal, and sword fern in a clear 7" classic urn vase. Let our expert florists handpick the freshest, most beautiful flowers to create one-of-a-kind arrangements, all at an affordable price. Your mixed bouquet will be created by Mom & Pop Flower Shop using the freshest, most beautiful flowers available. 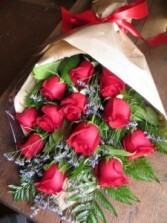 The flowers included in each one-of-a-kind bouquet are selected to give maximum value for your money. Attractive bouquet sent out in a gift wrap, this arrangement speaks of all of the glory of the traditional red rose bouquet, but is made to fit your taste and budget. Comes with water tubes & Green filler. 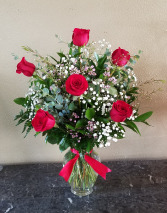 Premium long stemmed roses arranged in a glass garden Vase. Includes Mixed greens of fern and eucalyptus, and mixed filler flowers to create a full beautiful bouquet.